Among the successes, he cited progress towards forging a peace in Yemen, the Korean peninsula, and South Sudan; and between former enemies Ethiopia and Eritrea. He also highlighted the “successful outcome” of the UN climate conference in Poland last December, which resulted in overall consensus on how to implement the 2015 Paris Agreement on climate change. Other major international achievements of 2018 include the global compacts on migration and refugees, renewed engagement for peacekeeping operations, and major steps taken to reform the UN. “Partnerships are fundamental”, said the Secretary-General, especially in Africa, as the UN strives to “consolidate gains towards peace on the continent,” in particular in the Sahel, Mali, South Sudan, Somalia, the Central African Republic and the Democratic Republic of the Congo. Other conflicts where effective diplomacy will be critical and require the “unity and support of the Security Council” to overcome deadlocks are Yemen, Libya, Syria and Afghanistan. “As we strive to end conflicts around the world, we understand that lasting peace must be based on a broad consensus of society, with women as full participants in all peace processes,” the UN chief added. “And by 2050, we need to reach net zero global emissions,” he stressed, explaining that this will require enhanced efforts now, both to reduce emissions and to seize the opportunities of a clean, green energy future. In September, right after the Climate Change Summit, the UN chief has invited heads of State and Government to gather for another summit, focused on how to accelerate action towards the SDGs, and three other prominent meetings on financing for development, universal health coverage and the risks faced by Small Island Developing States. “I urge you all to do your utmost to make September 2019 a defining moment for stopping runaway climate change, achieving the Sustainable Development Goals and building a fair globalization,” he said. The UN’s efforts on this front will focus in 2019 on “reducing digital inequality, building digital capacity and ensuring that new technologies are on our side as a force for good,” he said. “Today, those values are under attack around the world,” he warned, explaining that “an ideological battle is taking place,” and that “we hear the troubling, hateful echoes of eras long past, and noxious views moving into the mainstream”. The UN Secretary-General called for deeper efforts to “show that we understand people’s anxieties, fears and concerns” and to “address the root causes that lead people to feel marooned in our rapidly changing world”. 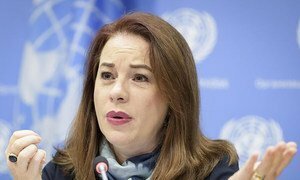 Revitalizing the United Nations to “strengthen a multilateral rule-based world order” tops a list of priorities the General Assembly President told UN Member States on Tuesday.